Join us for a round of food, fun, friendship and of course SONG. Sign up on Monday to bring your favorite brunch dish. Fabulous start to this season and looking forward to a fantabulous concert! The link to access the mp3 rehearsal tracks is in the "Members Only" section of the website. CDs on Monday! 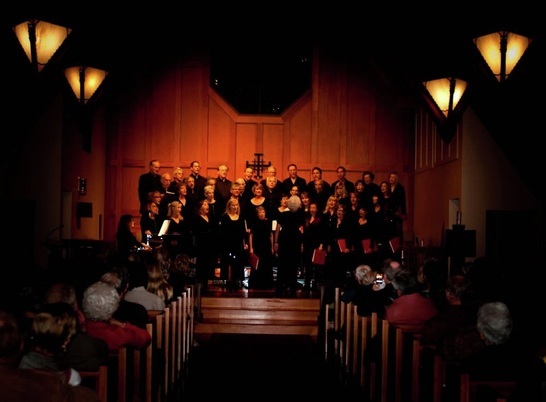 LagunaTunes Community Chorus meets on Monday nights in the Thurston Middle School band room from 7:00 to 9:00pm beginning February 4th, 2013. The LagunaTunes small ensemble meets Tuesday evenings from 7:30 to 8:45pm beginning February 5th, 2013. Please check our calendar for rehearsal and performance information. The chorus is directed by Bob Gunn who is also a director with Men Alive and the director of the Saint Mary's Episcopal Church choir. The small ensemble is directed by Christin Cornell and membership is by audition/approval. Please send us a contact for audition information. As our mission is to build a strong community chorus for all, we would encourage anyone wishing to participate in the small ensemble to continue to sing with LagunaTunes on Monday evening. To Say About Our Last Concert! 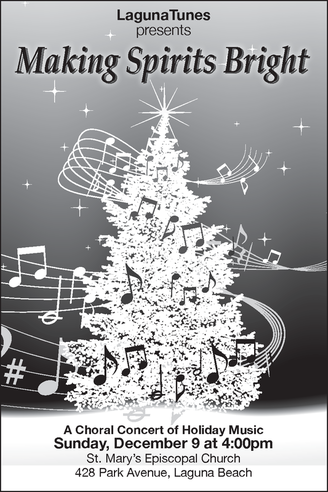 Bravo to the LagunaTunes Community Chorus for their Sunday afternoon "Making Spirits Bright" concert at St. Mary's Episcopal Church. 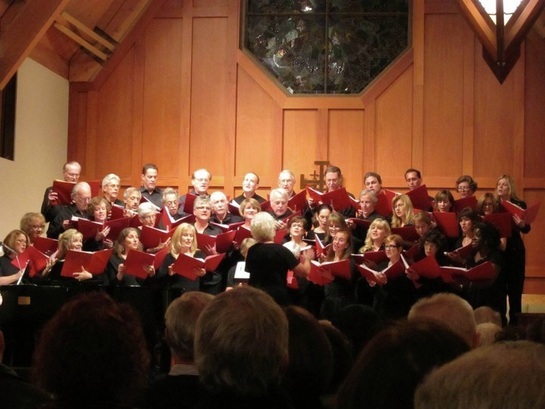 The LagunaTunes 50-member choir performed with its new director of the larger chorus, Bob Gunn, along with returning conductor, Cristin Cornell, directing the Chamber Music Ensemble. It was a glorious afternoon of outstanding choral music. The audience of 250 people filled the sanctuary long before the concert started, necessitating Rector Rechter's asking for more chairs to be brought in to fill the aisles and the front and back of the auditorium. Patti Jo Kiraly, president of the LagunaTunes, introduced Gunn and the retiring director of the chorus who was in the audience, Roxanna Ward. The Chamber Ensemble sang nine songs, familiar carols and new renditions of old ones. The performance was flawless. Captivating the audience was soprano soloist Sarah Geocaris singing "O Holy Night." Deborah Glass was the accompanist. Then the LagunaTunes continued the performance, singing many familiar Christmas songs and carols. "It's Beginning To Look Like Christmas" began their second half. "Fruitcake," "Dig That CrazySanta Claus" and a very interesting new number, "Et In Terra Pax," along with "Ave Maria," added classical numbers to their repertoire. Many people in the audience remarked on the joy the singers expressed — smiling throughout and some even gracefully moving to the music. Soloists for the LagunaTunes in different songs were Cathy Itnye, Carla Bruce, Karen McBride, Randy Hatfield, Jacoby Hickerson, Kimberly Clark, Philip Hagemann, Penny Leka, Frankie Harrigan, Gary Greene and Rob Harryman. The concert concluded with Handel's "Hallelujah Chorus," for which Gunn invited the audience to sing along with the choirs if they so chose. Many did and it added to the joyous spirit, and indeed made many spirits bright for the Christmas season. I was reminded that when I was a little girl of 4 years old and for many years thereafter, my aunt always took me to Philadelphia to hear my mother and father sing the "Hallelujah Chorus" in the Bach Chorale, directed by Dr. James Dash. Seventy some years dashed away as I listened to "Hallelujah, Hallelujah" once more. I and everyone in the audience was once again inspired and at peace. The concert was wonderful.